I’ll be honest with you, I don’t flip out over string beans. Yellow or green, I make my string beans the same way every time; chili flakes and shallots, with a hit of juicy lemon at the end. Season with flaky sea salt. Eat straight from the pan. And yes, no matter how I cook them they still squeak (what’s up with that?!) Someone once told me that squeaky beans = undercooked. What do you think? I’m on the fence. I use a 1 pan cooking method which involves both steaming and sauteing. This ensures that the beans will be soft in the center, yet crisp-tender on the outside. 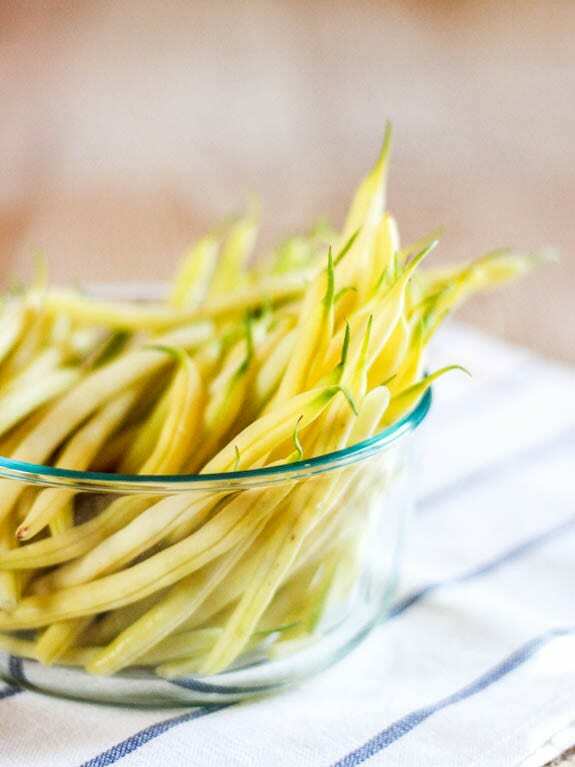 I’m partial to haricots verts for their thin, tender texture and sweet flavor. Both yellow or green will work for this recipe. Instead of dried chili flakes, you can substitute with fresh chili for a fruity, spicy kick. In a large saute pan, warm a splash of olive oil over medium-low heat. Add the yellow beans, shallots, garlic and chili flakes. Season with salt. Saute the beans until fragrant, about 1 minute. Add a small splash of water to the pan, and place a lid on top. Cook the beans on low for about 3-5 minutes. Tip: If your heat is too high, the outside will overcook, causing the inside to remain crunchy. Remove the lid, and continue to cook until all of the moisture has evaporated and the beans are crisp tender. Add a small squeeze of lemon juice to taste. Adjust with more lemon and salt as desired. I love string beans!! This is such a great way to give them a kick! Love it! This dish looks so good and healthy. I cant wait to try it. What beautiful lovely beans! A really gorgeous side dish and I love that they are one pan!! I love string beans, what great flavors! I’ve never noticed “squeaking” – I usually cook mine to fork tender, or al dente! This is such a bright and cheery side dish. It would be a great summer picnic dish served cold too. I will definitely save this for a lovely new way to serve up green beans. I adore beans, and these look fab. It’s vegetable asason, I think. I’m writing about the too! I’ll have to try your recipe. Haha, I know exactly what you mean by the squeakiness of string beans…. it can be unnerving but with a recipe this delightful, no matter. Simple perfection. (love the addition of the chili flakes — that’s right up our alley!). Your recipes are always so gorgeous! 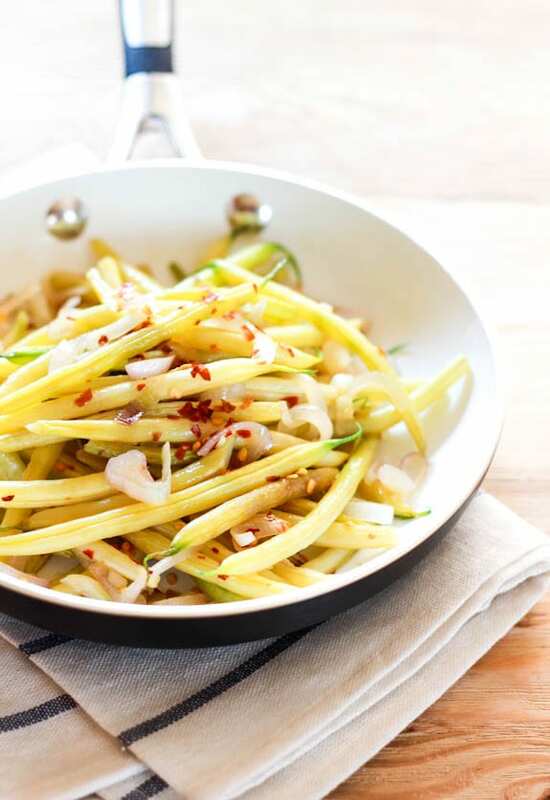 Yellow beans never looked so good! Delicious …but do not put 1 tsp of chili flakes…..Next time I would put none or only 1 shake. Otherwise this was delicious!!!!!! The bean consistency was perfect!! Just made it. It tastes great! !